Patrick T. Reardon discusses his poetry collection, Requiem for David (Silver Birch Press, February 2017) and other writing in a Chicago Sun-Times feature published on July 20, 2017. Find the insightful article here. Listen to a related podcast at this link. Photo by Rich Hein, Chicago Sun-Times. AUTHOR’S PHOTO CAPTION: The photo was taken that summer. In one of the dresses the boss wondered about. NOTE FROM THE AUTHOR: My first real job, in an office in the downtown YMCA, opened my world in dramatic ways. Used to being part of a group (of classmates, of siblings, of friends) I was suddenly on my own in a new environment, with new rules, new expectations, and new freedoms. It was an exciting, even magical time for me. ABOUT THE AUTHOR: Mary McCarthy has always been a writer, but spent most of her working life as a Registered Nurse. Her work has appeared in many online and print journals, including Earth’s Daughters, Gnarled Oak, Third Wednesday, and Three Elements Review. Her echapbook Things I Was Told Not To Think About is available through Praxis magazine online as a free download. .She is grateful for the wonderful online communities of writers and poets sharing their work and passion for writing, providing a rich world of inspiration, appreciation, and delight. Thank you to the 105 authors — from 25 states and 13 countries — who participated in our MY FIRST JOB Poetry & Prose Series, which ran from May 7 through July 4, 2017. Many thanks to the following authors for sharing stories and poems about their fledgling days in the workforce! 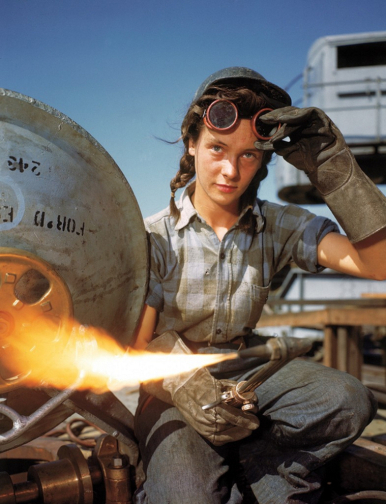 PHOTO: Welder at boat and submarine building yard, 1943 (Bernard Hoffman, LIFE Magazine). in all black, ready for our orders. the line and faces us; eyes focused. He lifts his arms to gather our attention. as they stretch out to the ceiling. before gently flicking his wrists. as we march and sing. as people clapped and cheered. to begin training once again. IMAGE: “Dancers” bt Erte (1892-1990). NOTE FROM THE AUTHOR: Before I began my journey as a writer, I was a vocalist for two years. I remembered my very first performance. I was so scared that I would mess up the choreography or do something wrong. My instructors were strict. We had to practice standing still, posing, smiling, breathing, silence, and everything above. But once we finished I felt a sense of relief and accomplishment. Over time, it became natural. We were a force to be reckoned with; similar to the military. AUTHOR’S PHOTO CAPTION: This is one of the performances I had to do in 2013. This was around my second year performing. We always had to wear these long black gowns for all our performances. I was a senior at the time. ABOUT THE AUTHOR: Angela L. Treviño is a student at Aurora University studying English. She also is minoring in Latino Studies, Political Science, and American Sign Language. She invests her time in improving her writing. She loves to write most of her poems in Spanglish, a hybrid of both English and Spanish. She has a goal of publishing a poetry book before she graduates from college in Spring 2018.
like the 50s) — the slow economy was soon to go BOOM! IMAGE: “Order and Disorder” by Jasper Johns (1960). NOTE FROM THE AUTHOR: My first job was as odious as it is memorable. The strands that transformed the thinking of American youth during the late 60s and early 70s are woven through this poem. It was a time when we were happy; it was a time when we were miserable. It was a time when young people were certain; and everyone else seemed confused. But it was not a time of mental chaos. It was a time of fundamental change. What ethics and goodness we have maintained from those times to the present is, alas, more difficult to measure. ABOUT THE AUTHOR; Joanie HF Zosike’s poetry most recently appears in the publication 11/9: The Fall of American Democracy, Eds. Casey Lawrence and William D. Dickerson, released on May 26, 2017. She is a frequent contributor to the Silver Birch Press blog as well as other pubs, including Bastille, Heresies, Levure Literraire, and Rabbit and Rose. Her work is also featured in Silver Birch Press anthologies: Alice in Wonderland, Ides, Noir, Summer, and The Great Gatsby. Joanie is a writer, actor, singer, director, workshop facilitator, caregiver ,and activist living in New York City and Manchester, New Jersey. IMAGE: “Numbers in Color” by Jasper Johns (1958-59). NOTE FROM THE AUTHOR: A major surgery in class 7 left me with a weak nervous system. This meant I stammered badly when I tried to talk. My self-confidence was at its lowest low. I felt at peace when I did Maths. I loved Maths and “She” loved me in return. Surprisingly, I stammered less when I was explaining Maths or talking to Maths. That love for Maths opened the opportunity and for a long time, that was my first job. I taught Maths to children for years. Vijaya Gowrisankar‘s fourth book of poems, Savour –Art and Poetry Meet, was published on April 30, 2017. Her first three books of poems, Explore, Reflect, and Inspire, are all bestsellers. Her submissions have been published in Silver Birch Press, Nancy Drew Anthology, Poetry Marathon 2016 Anthology, Sometimes Anyway: Pride in Poetry Volume II, Forwardian, Triadae Magazine, iWrite India, Dystenium Online, and Taj Mahal Review anthologies. She has appeared as guest speaker in colleges. A participant in the Poetry Marathon 2016 (24 poems in 24 hours, 1 poem per hour), she has reviewed and edited poetry and fiction books. She participated in NaNoWriMo 2016 and completed her first novel in November 2016. Follow her on Facebook and Twitter. Visit her blog at vijayagowrisankar.wordpress.com. IMAGE: “0 through 9” by Jasper Johns (1961). NOTE FROM THE AUTHOR: When I look at my first job and all the other jobs I did after that, I find a striking difference. Though life is a constant learning process, my first job was a threshold when my education was put to practical use for the first time. It was a great learning experience. Theory and practice and two different worlds. That was my experience and that is what I have tried to highlight through my poem. ABOUT THE AUTHOR: Vincent Van Ross is a journalist and editor based at New Delhi in India. He writes on national and international politics, defence, environment, travel, spirituality, and scores of other topics. Apart from this, he dabbles in poetry, fiction, nonfiction, and humorous writings. His articles and features have appeared in over a dozen newspapers and magazines in India and Bangladesh. He is also a renowned photographer and an art critic. His poems are littered in anthologies and journals across the world and on numerous poetry sites and facebook groups on the web.